Having duplicate content on your website is not going to increase rankings for it. Many of them make attempts to create several web pages with the same content to trick Google and other search engines in order to generate traffic and get more and more ranks. One thing we have forgotten that Google is one step ahead of us. With its highly advanced algorithms, it can sniff out duplicate content that are put anywhere. 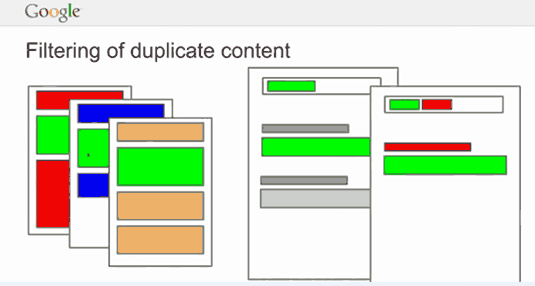 Duplicate content refers to the same content being used repeatedly that are similar to other contents used across various domains. Google has clearly said that duplicate content has a negative effect on your own websites, so it modifies its algorithms everyday to be a guard against these tactics. What can be done to avoid such issues? You can find the above option within the diagnostic section of its web master tools. It helps in detecting duplicate titles tags or we can say as Meta descriptions. Ideally, in simple terms each title should be unique in each page. Different software’s are also available online that will carry out a full check of your site and report back if any violations like duplicate content and broken links are found. With the help of such reporting tools, it becomes easy to identify any errors in the site and improve your website’s performance. This is another tool that is used to check for any duplicate pages within the same site. All you have to do is to type the website URL in the search engine that you are using, prefixed by the word “site”. Wait for the results to be displayed and then you can review them and check for any page titles or descriptions that are same. This tool will help you to identify those web pages that are not working efficiently as per your expectations. It will help you to keep a check on any landing page of your website that is not having any visitors or has relatively less traffic. This becomes an indication that it contains duplicate information and is not being indexed by Google. Platinum SEO Services is an extra ordinary firm with a team of local SEO at Sydney. They offer various services like internet marketing strategies, web design, content management and search engine optimization. They help in creative effective online marketing strategies once the website is live and uses techniques like SEO and social media to ensure that clients grow their business. The one stop solution for all your website needs.